Ms. Gorecki's, Ms. Staatz', and Ms. Bossany's River Heights Kindergarten Classes perform their Circus Alphabet.Ms. Gorecki's, Ms. Staatz', and Ms. Bossany's River Heights Kindergarten Classes perform their Circus Alphabet. Teaching Artist Kobi Shaw brings circus arts to the classroom curriculum as part of Arts Integration Menomonie. Teaching Artist Beau Janke worked with Ms. Avery Weber's First Grade Class at River Heights Elementary School. Featuring "The Big Song", "The Peace Corner", and "The Singing Tree Project". Ms. Kelm and Ms. Gunderson's 2nd Grade Classrooms at River Heights Elementary show their knowledge of the phases of the moon. Using the arts of music and contortion, they embody the moon in its life around the Earth. Teaching Artist Kobi Shaw uses Circus Arts to enhance the 2nd grade curriculum. Ms. Kelly Gunderson's 2nd Grade Class performs circus arts to illustrate the interaction of the Sun, Earth and Moon. They also use the idea of a clown car to highlight the phases of the Moon. Teaching Artist Kobi Shaw brings circus arts to the 2nd Grade curriculum. Members of the River Heights Second Grade class of Ms. Rachel Kelm present circus skills for AIM's Arts Night. Teaching Artist, Kobi Shaw, integrates Circus Arts into the Kindergarten curriculum. 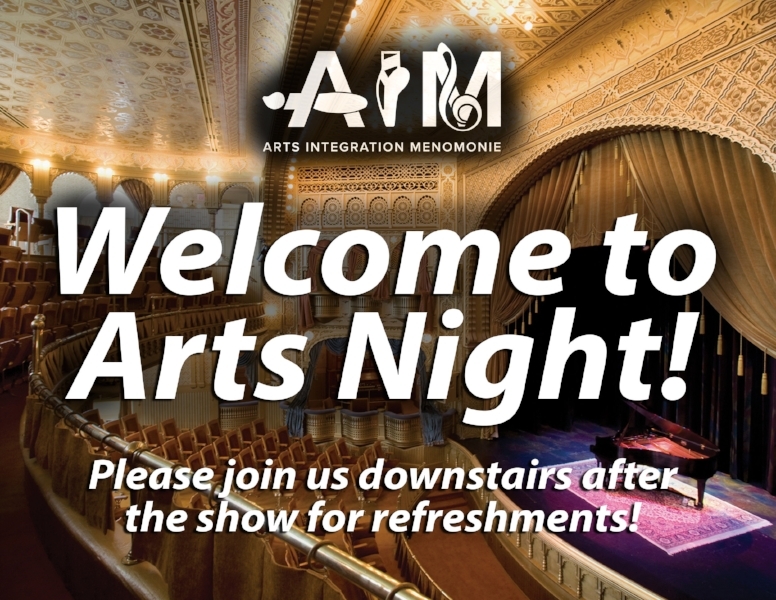 Three Arts Nights, featuring performances by teachers, teaching artists, and students showcased Arts Integration Menomonie’s inaugural year of its c.i.t.a. (Co-Teaching In and Through the Arts) program. Students of Wakanda Elementary Kindergarten Class present the Solar System, using circus arts to enhance their curriculum. Teaching Artist Kobi Shaw. The 3rd Grade students of Oaklawn Elementary present their slightly skewed takes on traditional fairytales. Teaching Artist Melissa Kneeland taught principles of drama, performance and creative writing to the 3rd grade students. Mrs. King's Kindergarten Class of Wakanda Elementary School demonstrates what they have learned about plant life. Teaching Artist Kobi Shaw. Mrs. Begley's Kindergarten class at Wakanda Elementary in Menomonie, Wisconsin performs "The Gingerbread Man at the North Pole" for A.I.M. 's Arts Night at the Mabel Tainter Center for the Arts. Teaching Artist Kobi Shaw. The River Heights second graders showcase arts-integrated lessons as part of the Menomonie school district’s 2nd grade curriculum with A.I.M. 's music composing teaching artist, Erika Svanoe. Arts Night showcased examples of arts-integrated lessons as part of the Menomonie school district’s curriculum. Here is “Caps for Sale”, retold by River Heights Kindergarten Team with storytelling Teaching Artist, Kris Winter. The Little Sprouts Academy of Menomonie, Wisconsin sings the Sight Words Song, accompanied by A.I.M.’s Percussionist Teaching Artist, Babatunde Lea. Teaching Artist Yata Peinovich and students from the Little Sprouts Academy performed their music-integrated curriculum at Arts Night. Mini residency with Oaklawn 5th grade team and AIM's Teaching Artist, Charis Collins.